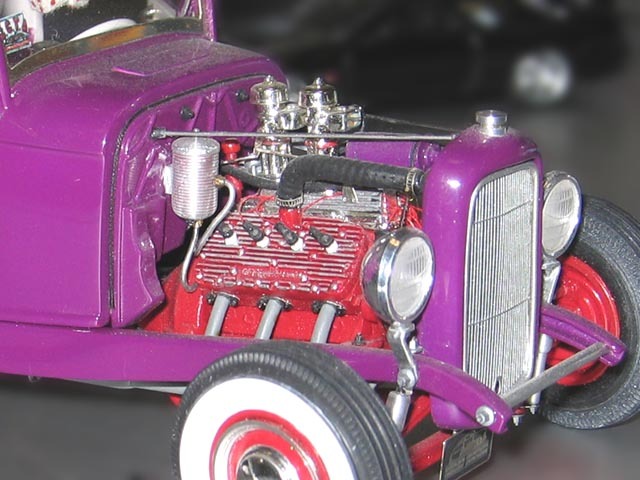 The 60-horsepower flat head engine required a lot of scratchbuilding. The Offenhauser cylinder heads were non-existent when Larry built this model, so he painstakingly glued more than 50 individual fins and 24 bolts to the cylinder head base. Fortunately for his sanity, Larry had to make only one cylinder head, then have two copies cast in resin. He scratchbuilt the two-carb intake and exhaust headers and had them resin cast to impart durabilty. Other scratchbuilt engine parts include: water pumps, generator, fuel pump, dipstick, and air cleaners. That impressive beehive oil filter is a machined aluminum piece by John McGowan. Jerry Duncan pronounced the model, "right on the money" we he first saw it some 14 years ago. It seems to be holding up as well as the original.